The HTC HD7 for T-Mobile ($200) went on sale yesterday, one of the four devices making its Windows Phone 7 debut, including AT&T's HTC Surround, LG Quantum and Samsung Focus. 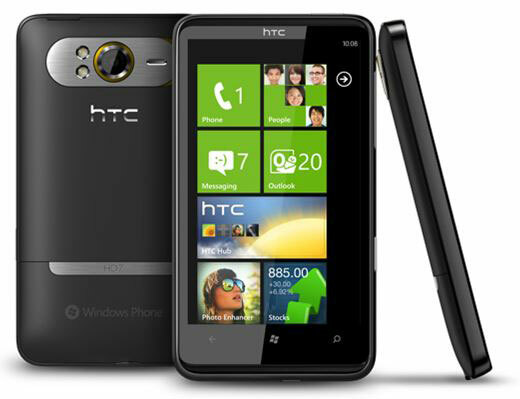 Like the other Windows Phone 7 devices, the HTC HD7 has a capacitive touchscreen, 5MP camera and a fast 1Ghz Snapdragon processor. But the HD7 stands out from the pack with a 4.3-inch display and built-in kickstand, which makes it the strongest of the bunch as a portable media center. Add it’s the only game in town, for now, if you’re a T-Mobile customer. The HTC HD7 has beautiful fit and finish, with brushed chrome accents and a rubberized back. The kickstand is fully functional and yet almost indiscernible when flipped flush with the back of the device. Measuring 4.8” x 2.67” x 0.44”, the HD7 felt large in my small, woman-hands and when held up against my head. And weighing in at 5.7 ounces, it’s on the heavy end of the smartphone scale. 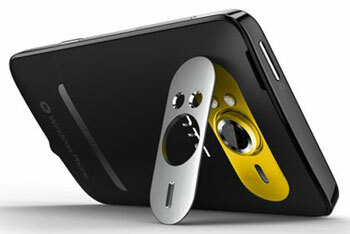 But none of this is out of character when compared with other 4.3-inch devices, such as the HTC EVO and Droid X. And of the three, I preferred the HD7 for it's smoother sides and humpless back. The display on the HTC HD7 is a large 4.3-inch capacitive LCD touchscreen and compares favorably with the Motorola’s DROID X and HTC’s EVO (both 4.3 inches). While the HD7’s display doesn’t pop like the Samsung Focus’s AMOLED 4-inch display, it’s plenty bright with true colors. And it has an industry standard WVGA resolution of 800 x 480. But this is not a device for a crowd unless you want to plug-in external speakers. The built-in speakers are very quiet, with tinny sound—disappointing considering its generous display. Headphones are a must. The Windows Phone 7 operating system handles all the smartphone basics well, and in some cases admirably. What makes Windows Phone 7 different from its competition? It starts, appropriately enough, on the Start screen where the customizable app tiles contain usable information rather than just a pretty icon. And deeper in, it works to bubble up useful information and functions that cross app lines. For those of us who use our phones for work, Windows Phone 7 offers built-in support for Office files—Word, Excel, PowerPoint and OneNote. Opening an attachment from email and viewing the document were about as easy as can be expected from a mobile phone. There’s no cut-and-paste, so editing is a pain. Cut-and-paste has been promised by Microsoft for 2011. But it can’t come soon enough, as far as I’m concerned. When I reviewed the HTC Surround 7 almost 3 weeks ago, the app situation was a little bleak. I’m happy to say that it’s really coming along. Some favorites I have loaded include Netflix, Twitter, Facebook, Yelp, Slacker Radio, Fandango, YouTube and Weatherbug (which pushes weather info to its live tile on the start screen). Of course it’s still nowhere close to the number of apps available for Apple’s iOS 4, Android or even Blackberry. The other big disappointment with Windows Phone 7 is the lack of true multitasking, which means you can’t run third party music apps in the background. You can play tracks using the Zune player while checking email, but not Slacker Radio. Like the iPhone and many Android devices, Windows Phone 7 doesn’t support Flash, which means that on some sites you won’t be able to play videos or interact with some aspects of the navigation. There’s a YouTube app that enables video playback if sites use YouTube’s regular video player, but not if the site uses the YouTube iFrame player, which is what we use for Techlicious. The HTC HD7 has a 5MP camera with a dual LED flash and takes 720p HD video. The camera takes good indoor shots for a cell phone, even without the flash, though the colors are a little oversaturated. And the second LED bulb for the flash makes the camera usable in low light situations. The camera doesn’t do well in low light without a flash and video suffers as well. Autofocus takes a while, though, so don’t expect to get any fast action shots. With its 4.3-inch screen, the HD7 is wide enough for easy thumb typing when held vertically and spacious horizontally. It has very gentle haptic feedback, which I like, but it can’t be turned off if you don’t. It also has a word suggestion bar that updates as you type and will autocorrect your mistakes. It was surprisingly accurate. You can also go back and tap on a word and it will pull up the same suggested word bar so you can make a substitution. Navigation consists of the start screen, which you can customize with your favorite apps, contacts, music—pretty much anything, and second screen with a full list of apps. Within apps there are usually multiple screens plus a navigation bar at the bottom with context sensitive buttons and a menu icon that brings up addition options. The buttons are unnecessarily small, which might cause some problems for those with large fingers. The HTC HD7 comes with 16GB of onboard memory, which should be plenty for most people, but no memory card slot for expansion. Under normal (for me) conditions with occasional calls, web browsing and app usage, the HTC HD7 lasted me through the day, which was fine. What I didn't like was the HD7's slow charge time, noticably worse than other smartphones I'm using. The HTC HD7 is available at T-Mobile.com for $199.99 or Wirefly for $149.99 —both with a new, two-year customer agreement.. When compared to the other Windows Phone 7 devices, the HTC HD7 stands out for its large display, kickstand and classy build quality. You should seriously consider the HD7 if you’re looking for a Windows Phone 7 device that will function heavily as a media player. When you broaden the choices to Apple and Android, though, the HTC HD7 is not on the cutting edge. There are no 4G speeds, no mobile hotspot capabilities, no front facing camera. This is not the phone that will drive people to make the switch to Windows Phone 7. The HD7 has the 4G antenna in it - It is not advertised as 4G, but it is. I run 5.5MBPS in Atlanta on it. @Durel Perhaps you are getting those speeds over EDGE (or you’re not really getting those speeds, not sure how you’re testing), but the HD7 does not have HSPA+ capability. And you can be sure that if it did, they would be advertising the heck out of it.